Recurring chatbot surveys enable you to engage your audience on a regular basis in the apps that they already use. 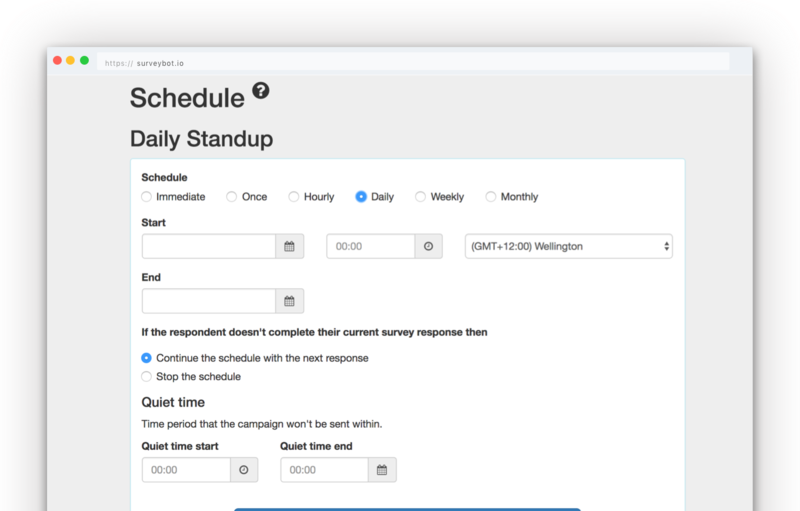 We’re excited to announce the release of our new Recurring schedule feature that enables you to create your own recurring chatbot surveys. Configure the Schedule you want to send your survey on. This could be just a one off, hourly, daily, weekly or monthly. Enter an End date for your campaign. If you are sending your survey on a recurring schedule you may want to to end on a specific date. It is optional to set an end date and if you don’t set an end date you can stop the campaign from sending at any time. Select your schedule behaviour in the case where a respondent doesn’t answer one of the surveys. If this happens you can stop sending surveys to the respondent or just continue with the next survey. Enter a Quiet time period. This is used to ensure that the survey doesn’t send during times where you don’t want to disturb your respondents. That’s all there is to it. Surveybot will then allow you to see all of your surveys for each of the time periods they are sent within your campaign. You can also export the responses for each time period from within the campaign overview page. Try out Recurring chatbot surveys on Surveybot today!